Korrigan is among the many small supernatural beings that have been handed down to us from our ancestors in the form of tales and legends. The name derives from the ancient Breton “Korr out Korrig” or, more simply, dwarf. These are small beings who are able to swell themselves up to a monstrous size, they have abnormally large, wrinkly heads and pointed ears. They sometimes have tiny horns, curly hair and black or red eyes, and their voice is deep as though coming from the bowels of the earth. Notwithstanding their minute size they have tremendous strength! They are usually dressed in grey, black, green or brown cloth, only on rare festive occasions do they dress in vivid colours. They wear enormous hats adorned with all types of feathers, bells and velvet ribbons. Their ‘costume’ is completed by a large belt at the waist from which hang horns and a leather pouch containing gold and pipe tobacco. They live in unexplored areas, preferring to come out at night and dance in the moonlight; they love springs and fountains, where they wait for passing wayfarers on whom they play mischievous practical jokes. They are clever thieves obsessed by gold, and are the guardians of enormous treasure hidden in the hills. If treated with respect and kindness they are friendly. Their fame is that of being skilled alchemists and expert craftsmen, specialising in various professions and crafts, especially distillation and hunting; they are long-lived but not immortal. 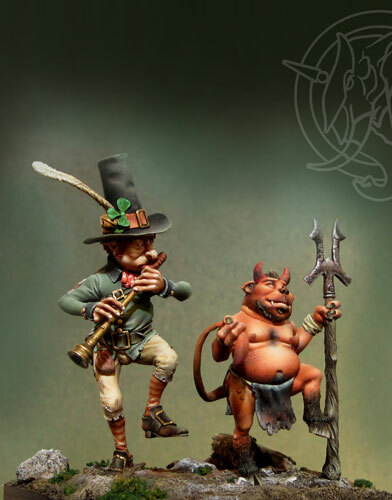 Among the many Korrigan clans, the most familiar are: the Kornikaneds who live in the woods and are skilful horn blowers, the Korris Mori, good dancers in the moonlight and skilful riddle-makers, the Poulpikans, lair dwellers and specialists in faunal doctrines. Old folk tales tell of their presence in the woods, however, there has never been any certainty as to their existence. As good Jack Happendown said, “Only those who believe… see”. He is a Korrigan belonging to the ‘Kornikaneds’ clan, directly descended from the progenitor ‘Stug Brokenshoes’. His family has served the Korrigan community for centuries. 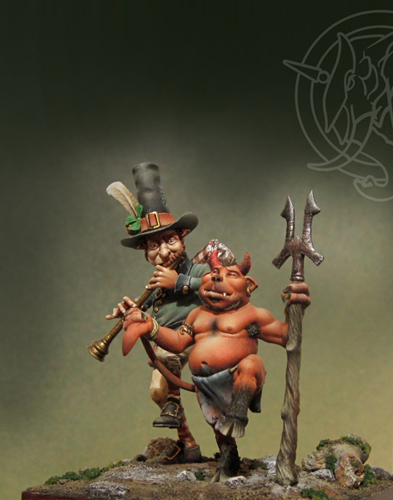 Old Stug, his ancestor, was proclaimed defender of the clan when, on the occasion of one of his journeys into the bowels of the earth, he found an extremely strange red horn. The magic properties of this horn were unknown for a long time until, during one of the many moonlit celebrations, old “Stug” decided to try out the sound of the horn. It produced such sweet and gentle music that before long all those present at the rite were enraptured by the music, and they certainly weren’t the only ones! 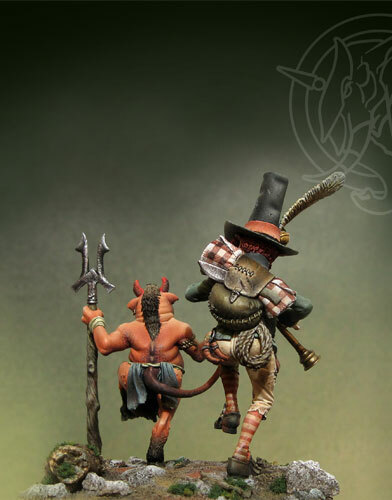 In fact, a rustling sound was heard coming from the woods, and two Bols emerged out of the brushwood, dancing and grunting delightedly, as if in ecstasy! Old Stug, amidst the general amazement, realised that the sound of the horn had hypnotised those filthy creatures. From that night on he was called “Stug the Trombabol”. The story and the horn were handed down from father to son, down to our “Erlik” who, unlike his predecessors, improved the power of the sound by connecting the horn to a bronze pipe. If, on a night with a full moon, you happen to be wandering in a wood, prick up your ears and sharpen your sight and you may come across “Erlik” with his horn, intent upon hunting an unlucky “Bol”. “Bols”, whose name comes from the word Diabol, are wicked creatures who live beneath the forest in deep, badly ventilated and damp caves. They are usually bad-tempered and irascible, they love roaming alone through the brushwood and the briars, only occasionally joining up into groups to hunt man. They are fond of eating small rodents, like rats, moles and squirrels, but they don’t disdain larger prey like bear or ogre cubs. They are chaotic by nature and are attracted by music and children’s screams, which induce them to come out into the open and venture into the villages, where they create bedlam.